I am blessed with many local yarn stores, but one of my favourites keeps a blog in which new yarn is not infrequently categorized by its smooshiness factor. And though I do not - NOT - knit socks (if I knit socks too I would never, ever get anything else done around the house) when I saw this recent post I knew I had to come into the store and check it out for myself. Especially since I wanted to pick up some yarn for a particular hat I have in mind. Have you clicked on the link? 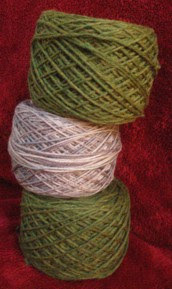 Do you see the skein that illustrates the blog entry? It's called 'shadow' and it shadowed me home. I don't knit socks and any hat knit with this (highly smooshy) yarn would have to be for spring or fall or ten years from now because that's how long it would take me to finish it on toothpick needles, but... It's Soooooo Smooshy! I also bought two skeins of Cascade Heathers 220 in a colour that matches the mittens on the cover of Vogue Knitting, Fall 2008, aka the mittens I cannot get out of my mind. I love the mittens, but I love the colour at least as much, and I will be swatching my idea for the hat to make with it today. But first I'll finish up the tidbit I made for the next free pattern. Stay tuned!